A dodgy-looking man and woman ransack Des's house looking for a tape. Lucy tells Daphne that Shane has got a bet going with Des that Daphne will go out to dinner with him. Danny cries because Maria is leaving for Hong Kong. He says he'll come and visit. Des finds that his house has been ransacked. Maria leaves the Ramsay house for Hong Kong. Shane gets drunk at Paul and Terry's reception and punches a bloke who Daphne has been talking to. But he loses his balance and ends up face-down in a cake! Des and Daphne are cleaning up the house. Shane comes round and she isn't pleased to see him. He says he's sorry and barges into the house. Des doesn't tell Shane about the ranscking, saying they're spring-cleaning instead. Shane insists to Daphne that he wants another chance, but Daphne firmly says no - she's had enough of Shane string her along. Des and Daphne agree that they'll tell Terry what happened in a few days. Shane and Max are packing their things ready to move back to Ramsay Street. Max says he's had some tough times in the bedsit. It sorted him out, but now it's time to move on and make a go of things. Max picks up the last box and surveys the empty bedsit. Then he closes the door. Scott and Danny are cleaning up the living room. Danny tells Scott that he's quite pleased that Max is coming home. He thinks he's grown up since Max left the first time, and he'll be able to live with him now. He says that Maria will fit in OK in Hong Kong. Anyway, Danny will be grown up soon and doing his own thing. He is clearly rather gutted underneath his brave facade though. Just then, George comes round to see Des. He's come to ask for Eileen's phone number - he's lost it. Des tells him to ring Eileen - he has Des's approval! Daphne tells Des that George is just what Eileen needs. Julie comes round and Des and Daphne explain that they're spring cleaning. Max and Shane drive up in the van and they start to unload the stuff from it. 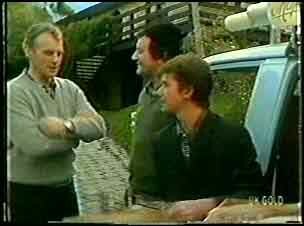 Jim comes out to welcome Max back to Ramsay Street. MAX: Well, the wedding went like a bomb, eh! But he tails off, realising Max doesn't know about the bomb scare after all. Max tells Jim that he's determined to make things work with him and the boys. Jim and Scott discuss the bomb scare - they're keeping it a secret. Jim asks Scott to keep an eye on Danny for a few weeks, while he settles in with Max. Julie comes in and says Daphne has got Des spring-cleaning. She wonders if she should ring Eileen to help them, but Jim and Scott put her off successfully. Jim tells Julie to stop bossing Scott around and say please and thank you to him! 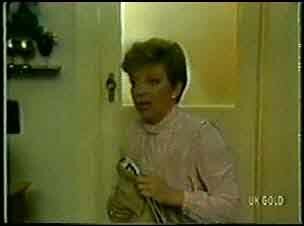 Julie goes over to the Ramsays to borrow a vacuum cleaner, despite Jim telling her to leave them alone! Max and the boys struggle in with some boxes. Julie comes in through the back door and immediately starts cleaning(!) She starts bossing Max around, but he tells her he can handle things. Eventually he manages to get rid of her, escorting her to the back door. Des and Daphne are still cleaning. Eileen comes round - Des had forgotten that he had invited her for Sunday lunch. Eileen picks up the wreath, but Daphne quickly puts it in the bin. Eileen busies herself making lunch. Des and Daphne enquire after George and Eileen admits that she has invited him round to her unit for dinner. Max has cooked lunch for the boys. It's rather different to Maria's fare(!) and not very well cooked! Shane and Danny suggest sharing the cooking around. Eileen is going on about how rare "men of refinement" are. Des lies on the sofa with a cushion over his head! Daphne is helping Eileen with her make-up while Des rolls his eyes. Daphne and Eileen start gossiping about what Eileen should wear on her date(!) Daphne offers to drive her home. DES: If you can't be good, be careful, Mum! Eileen sees Max and goes over to say hello. She tells him he's doing a grand job with Shane and Danny, and can't understand Maria walking out on her children. She bangs on and on and on about Maria and eventually Max starts to shout and tells Eileen to buzz off! Eileen and George are having tea after their dinner. Eileen accidentally spills wine on George and he has to go into the bathroom to change his trousers. Just then, there's a knock at the door and it's Des. 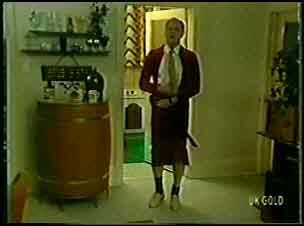 George comes out of the bathroom wearing a robe and Des looks shocked.